As times have changed and the younger generation have different ways to communicate, wether it is on social media, Instagram, , Snap Chat, Facebook etc…..
Do you think it is acceptable for a bride and groom to send a facebook thank you to their guest for gifts or do you think they should send a thank you card in the mail? My Facebook friends and family have all in agreement stated that is appropriate to send a thank you card and not a shout-out or thank you on social media. Your welcome to put your thought on here to give us your opinion. To make the process easier have a price range in mind before you start to shop. 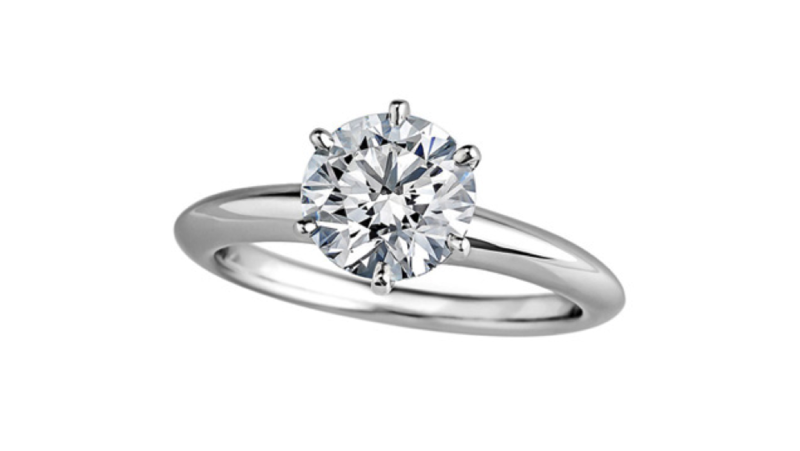 Going in with fairly specific parameters will help your jeweller find the right engagement ring to fit your budget. Before you even set foot in a jewelry store there is a lot to learn about diamonds. A good place to start is with the 4Cs – Color, Clarity, Cut and Carat Weight – so you understand how each influences the value of the diamond and adds to the overall appearance of the stone. In doing this you can decide which is the most important to you. If you pay attention to the kind of jewellery she already wears it could go a long way in helping you pick out the perfect ring. Does she wear more white metals or yellow gold? Do her pieces tend to be more delicate or chunky? Sleek or ornate? Have these preferences in mind when you set out to shop. If you buy something similar to what she already likes, you can't go wrong. If she wears rings, borrow one she already owns. Trace the inner circle on a piece of paper, or press the ring into a bar of soap for an impression. You can also slide it down one of your own fingers and draw a line where it stops. A jeweller can use these measurements to identify her approximate ring size. If she doesn't wear rings you can estimate in the following manner: The average ring size in Canada is 6 (based on the 'average' Canadian female being 5'4" tall and weighing 140 lbs.) If she's more slender, or fine-boned, her ring size is probably in the 4 1/2 to 5 1/2 range. If she is heavier, larger-boned or taller, her ring size is probably in the 6 1/2 to 7 1/2 range. It's always better to buy a ring a bit bigger than you think she'll need, because sizing a ring down is much easier than increasing its size. If she hasn't made it easy for you by already voicing an opinion or showing you a picture in online, in a magazine (or admiring someone else's engagement ring), keep these thoughts in mind when considering shape. She will be wearing the ring every day of your married life. She will want it to go with everything from jeans to evening wear. If you're uncertain about her diamond shape preference, it's sensible to stick to the classics, such as a round or square shape. They became classics because they are the most popular for most people. Preference in shape may be reflected in other parts of her life. If she prefers clean, modern lines in furniture, for example, it's likely she may tend to like the same aesthetic in rectangular or square shapes. 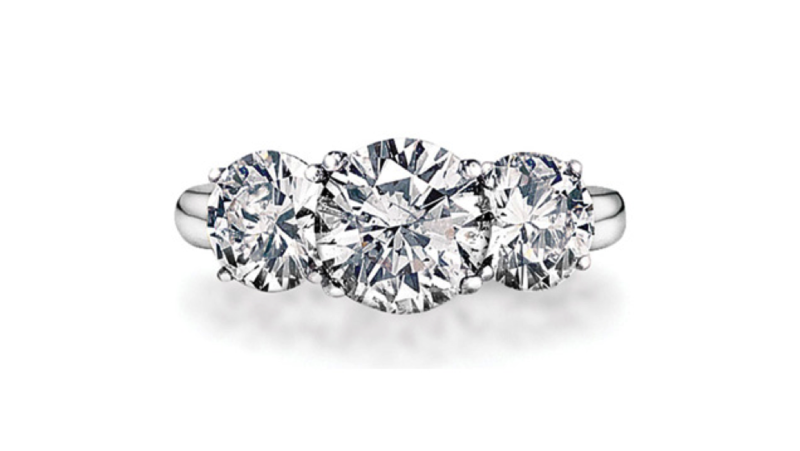 If she leans towards the traditional, a round shape rarely misses. Are her tastes eclectic or bohemian? She may favor more unusual shapes, like a triangular or marquise shape. Consider her lifestyle and how well a certain setting design will fit into it. If she's more active or outdoorsy, look for lower profile, less ornate or more secure mountings, which are less likely to get knocked against or caught on things. If she's more of a glamour girl, look for statement settings, with a higher stone profile and more intricate ring detailing. Smaller diamonds or other gemstones that flank the larger center stone for additional sparkle or color. Popular sidesstone settings include claw, channel (which protects stones by keeping them flush), and bar-channel (which allows more light to enter the sidestones). They can have sidestones that flank the centre stone as well as stones set in the shank of the ring. The center stone is surrounded by tiny gemstones in a pave (pah-vey) or claw set setting, usually diamonds, to add sparkle and to give the appearance of a larger center stone. A diamond engagement ring is meant to last a lifetime so it is often made of gold or platinum - highly durable metals that can withstand many decades of daily wear. Metal color is a matter of personal preference with gold providing more color options: white, yellow or rose. Metal color is also a consideration since the appearance of a diamond’s color is affected by its surroundings. Once you’ve selected your diamond, ask your jeweller to show you how it would look with different colored metals. You don’t have to go it alone. A good jeweller will ensure that your engagement ring buying process is stress-free. He or she will educate you about the 4Cs of diamond quality, answer your questions in detail, and help you narrow your choices to those that fit your intended’s tastes and your budget. Look for a jeweller that is professional and has good reputation – asking friends or relatives for recommendations or you can look at online reviews. You should also ask for a grading report, like those provided by GIA and other labs, prior to purchasing a diamond to validate the quality of your purchase. Buying an engagement ring can be much simpler than you think, if you educate yourself about diamonds and the 4Cs, know her tastes and find a good jeweler to work with. You should enjoy the process and imagine the look surprise and love you’ll get when you put that perfect ring on her finger! I was asked to write suggestions for Wedding couples on planning their day. Once engaged and date figured out, you should reserve your wedding venue in one to two years in advance. Get the venue you want and make a deposit to reserve. If you are two years ahead you can negotiate pricing and might be able to get this years prices instead of paying pro-rated prices in the future. Most venues actually charge more for a Saturday booking rather than a Friday night or Sunday afternoon / evening. So If you book in advance you have a better chance of negotiating a better price as they want the deposit. For people who have already had their wedding please respond on this blog on excellent places for the future wedding couples, on places they can visit to help them decide on a venue. There are so many options out there, a little help in the right direction can go a long way. Thank you for helping our new couples plan their day by your past experiences on great ideas and planning.